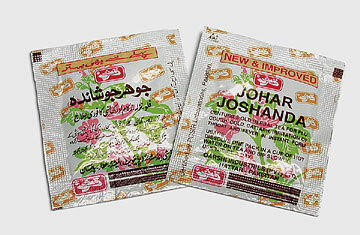 Translated, johar joshanda means "essence of boiled stuff." It comes from an ancient medicinal recipe of the Unani tradition — akin to a Muslim Ayurveda. Historically, the chief ingredients — licorice, Malabar nut, hyssop, tea, peppermint, fennel and eucalyptus — had to be boiled for hours, but manufacturers Qarshi Industries have modernized the method, reducing the brew to a concentrate, freeze-drying it like instant coffee, then packaging it in single-serve portions selling for eight cents a pop. These packets are now permanent components of my traveling first-aid kit. Not only does johar joshanda help when you're struck down with a virus, but it's great for combating the effects of long-haul air travel or pollution. Offering it to other afflicted travelers inevitably depletes the entire stock in a trice, and leads to endless demands for more. Bulk orders, for the record, can be placed by click on the following link (Buy Johar Joshanda), but these days my stash is jealously guarded.